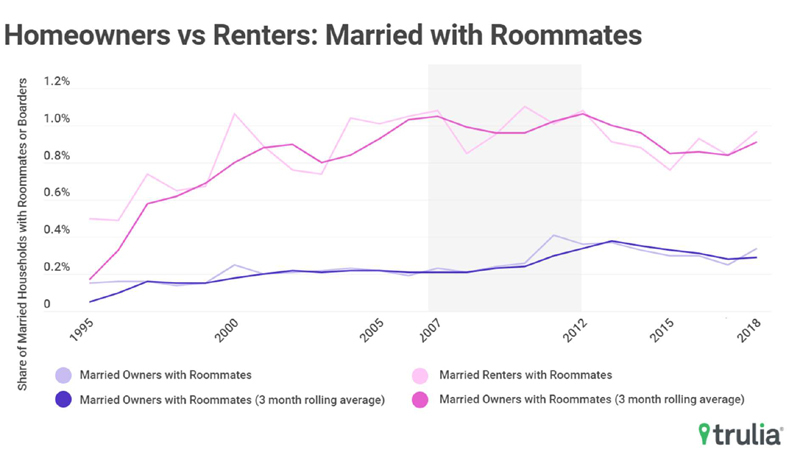 "While reasons can vary, the rate of married couples living with roommates has doubled since 1995 largely because it now costs more to own or rent a home. Married couples often take on a roommate to help the individual lighten his or her housing cost burden, or to defray their own housing costs. The two reasons are not mutually exclusive, and the data suggest that in recent years they were both relevant," Trulia’s chief economist, Issi Romem, told TODAY Home. "Housing markets on the West Coast are some of the most expensive and least affordable in the country. In fact, of the top 10 markets with the highest share of married couples with roommates, nine of them were located on the West Coast. As a result, these markets see higher rates than other markets of individuals and married couples that are challenged by the cost of housing, including some who resort to the married-plus-roommate scenario," Romem said. Trulia experts examined 23 years of census data to help inform their conclusions. 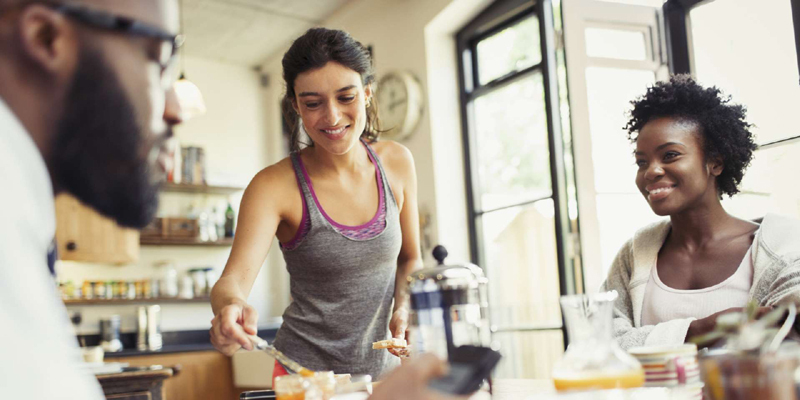 "Specifically, we looked at the national rates of married households living with roommates using the Current Population Survey (from 1995 to 2018) and the 2005-2009 and 2012-2016 5-Year American Community Survey releases," Romen said. They defined "married households" as household heads that are married with the spouse present. Roommates and boarders, on the other hand, were defined as those reporting their relationship to the head of household as that of a "Housemate or Roommate" or a "Roomer or Boarder." The study looked at all housing types, including single family home and multi-family units, and also considered both married homeowners and renters. One interesting conclusion the team made? Married homeowners are less likely to bring on roommates when faced with escalating housing costs than married renters. "Whereas renters’ cost of housing changes relatively often — when their landlord raises rent or when they move to a new place with higher rent — homeowners’ housing costs are usually fixed at the time of purchasing the home (so long as their borrowing involves a fixed-rate mortgage, as is most often the case). Thus, homeowners are less likely to experience escalating housing costs (and perhaps bring on roommates as a result)," Romen said. So, will the cohabitation trend continue? It depends how the housing market behaves over the next few years! "If housing affordability continues to worsen, we may see this trend continue. 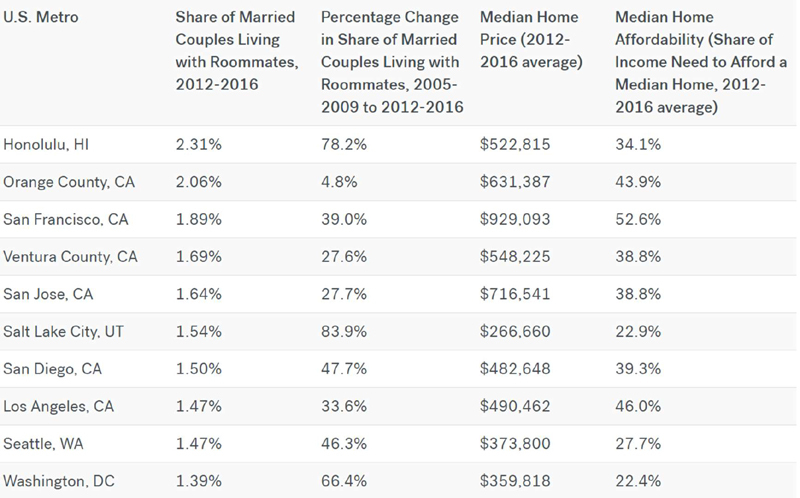 Looking at the past two decades, it appears that the trend of married couples living with roommates rises when housing markets place people under financial strain," Romen said. 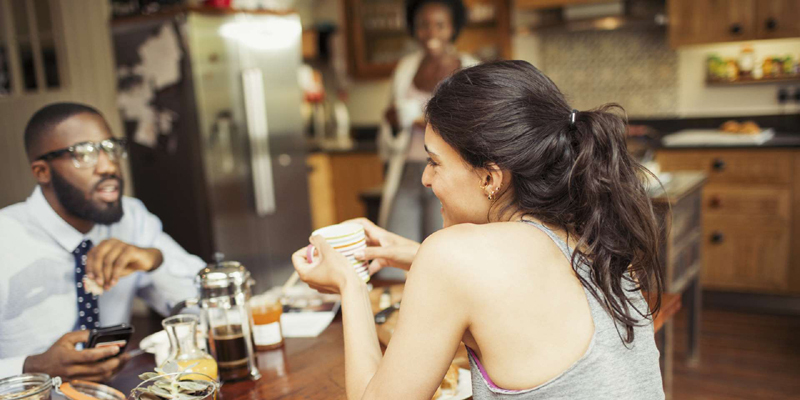 "While the housing market has started to ease up in some markets, rising housing costs and affordability issues will likely continue to put pressure on more couples to consider taking in roommates."